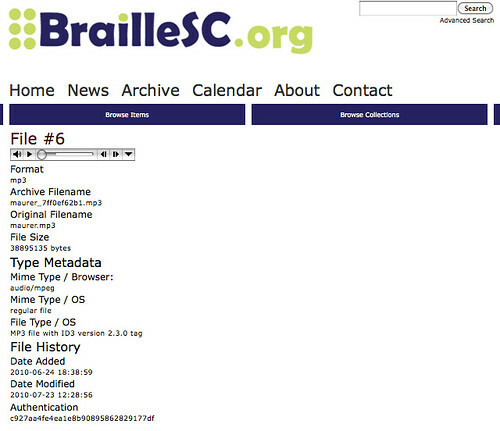 This entry was posted in digital humanities, film and video, research and tagged braille, braillesc, omeka by George H. Williams. Bookmark the permalink. Maybe I could use the display_items_for_file helper function in a video-dedicated page, and then use a conditional statement to display the appropriate file based on what kind of file it is (?). Okay, with some advice from Cory I found a solution (or at least the beginning of a solution). But I don’t want each item page to automatically display all of the files associated with the item. Doing so would be fine if each item had a few images associated with it, and if show.php displayed those images (or thumbnails of those images). It’s not so fine, however, when there is a large video file (or a number of large video files) associated with each item. If it is, the duration is displayed. Next, all the files are checked. If a file has the format ‘medium quality mp4’ — we’re thinking of having 3 different qualities of mp4s so users can choose, depending on the speed of their Internet connection — then a link to that file is created, using the words "Click here to watch." If a file has the format ‘mp3’ then a link to that file is created, using the words "Click here to listen." I’ve taken screenshots to illustrate the results (click on any image to embiggen).